Once upon a time there were three little pigs who set out to seek their fortune. As they wandered through the woodland, they were spotted by the Big Bad Wolf. 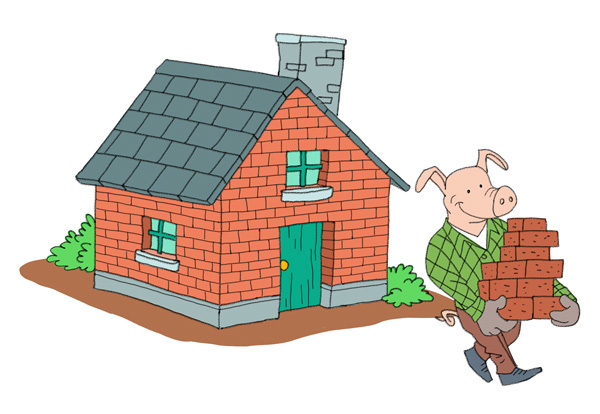 The little pigs, who were brothers, found a nice open spot of land, and there they agreed to settle. The land was plentiful, and they used the surrounding resources to build their homes. 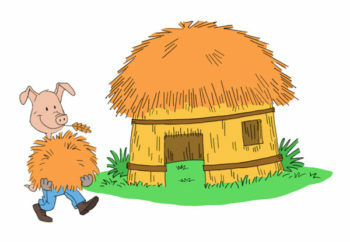 The first little pig gathered together a large bundle of straw, and used it to build his house. The wolf huffed and puffed, and blew down the house of straw. 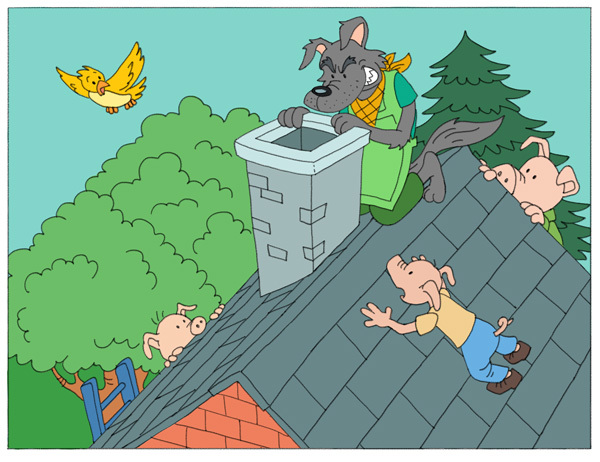 Before the wolf could eat him, the little pig jumped out from his ruined home, and ran off to find his brothers. 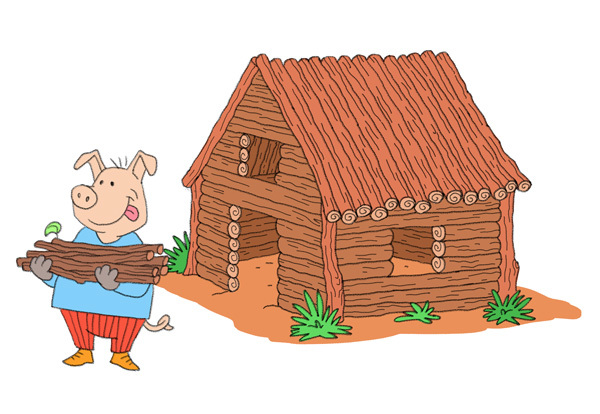 The second little pig collected a large bundle of sticks, and used them to build his home. So he huffed and he puffed, and he blew down the house of sticks. 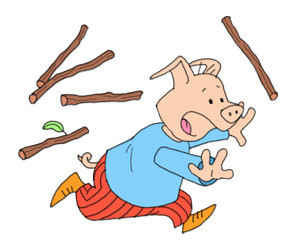 The little pig crawled from the pile of sticks, and before the wolf could catch him, he ran off to find his brothers. The third little pig found a large deposit of clay on the land. He formed the clay into bricks, and dried them in the sun. With these bricks he built his house. When he looked up from his work, he saw his brothers running toward him. “There is a wolf after us!” exclaimed the first little pig. “He means to eat us!” cried the second. “Come inside, quickly,” answered the third little pig. When everyone was safely inside, he shut the door and locked it. Not long after, the Big Bad Wolf arrived. 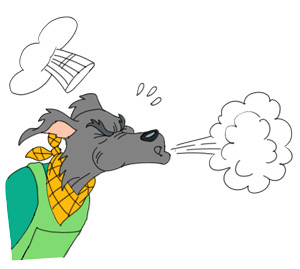 Well, the wolf huffed, and he puffed, and he huffed, and he puffed, but he could not blow down the house of bricks. The wolf scowled, and walked off. “You haven’t seen the last of me!” he yelled, waving his fist. 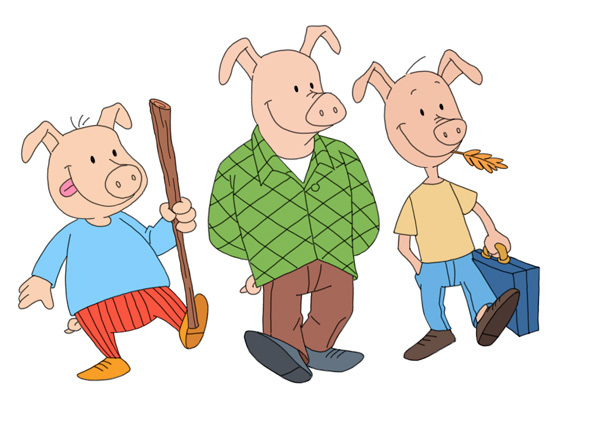 The next morning the three little pigs decided to go to Mr. Smith’s Home-field to gather turnips. The wolf spotted them in the field and chased after them. 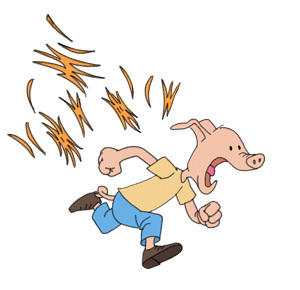 But the first little pig, who was pushing a wheel barrow, ran over the wolf’s foot. The wolf cried out, clutching his foot, and in this moment, the three little pigs escaped. 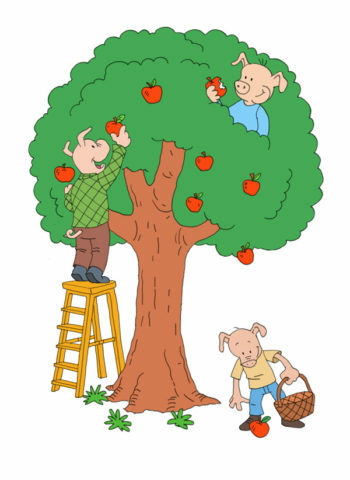 The day after, the three little pigs went off to pick apples at the big apple tree in Merry Garden. Soon the wolf found them. He waited at the base of the tree, ready to gobble up the pigs as soon as they climbed down. 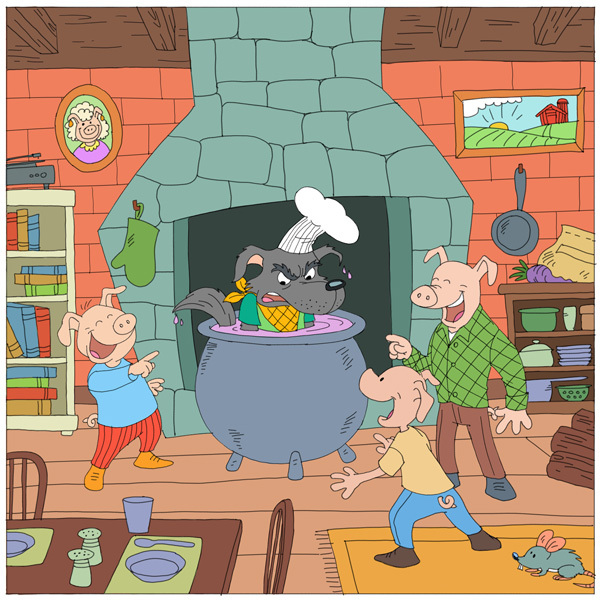 The three little pigs threw their apples and struck the wolf in the head. As the wolf lay stunned, they hurried down the tree and made their escape. 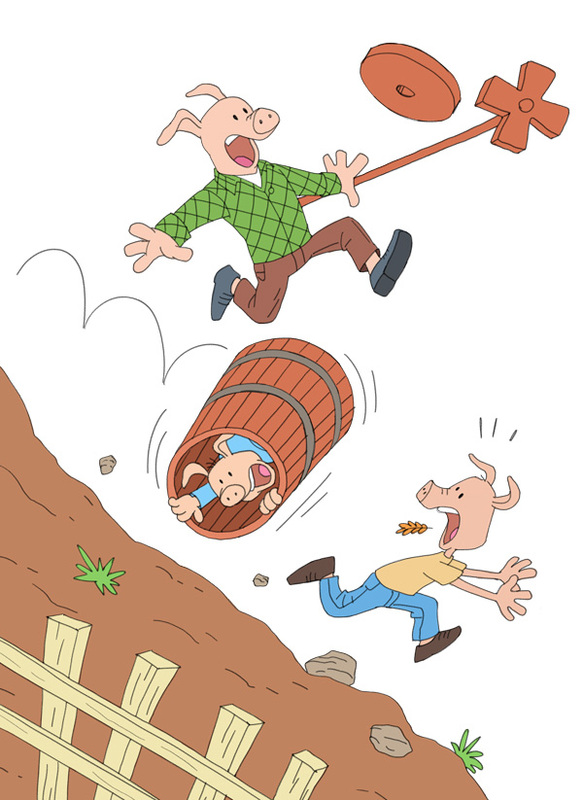 The following day the three little pigs headed to the Shanklin Fair to buy a butter churn. Soon they saw the wolf coming up the hill. Turning the butter-churn on its side, they rolled it down the hill. 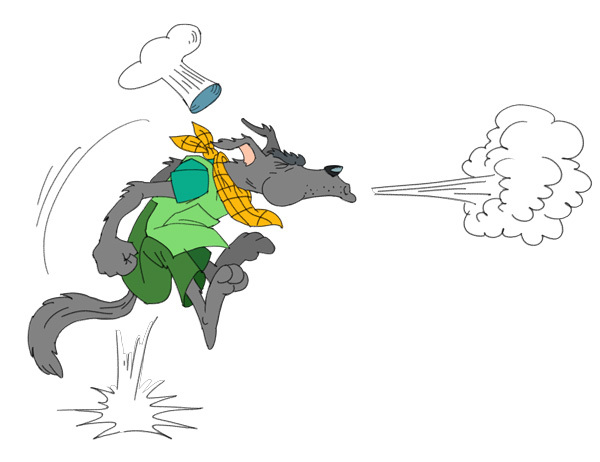 The butter-churn knocked the wolf off his feet. 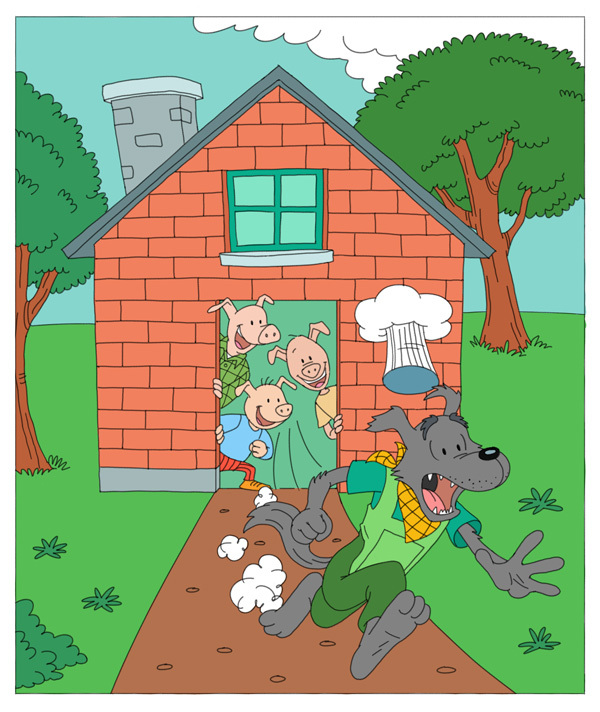 Before the wolf managed to get back up, the three little pigs were well on their way back home. He walked to the side of the brick house and climbed onto the roof. “I’ll sneak into the house through the chimney,” he said with a laugh. 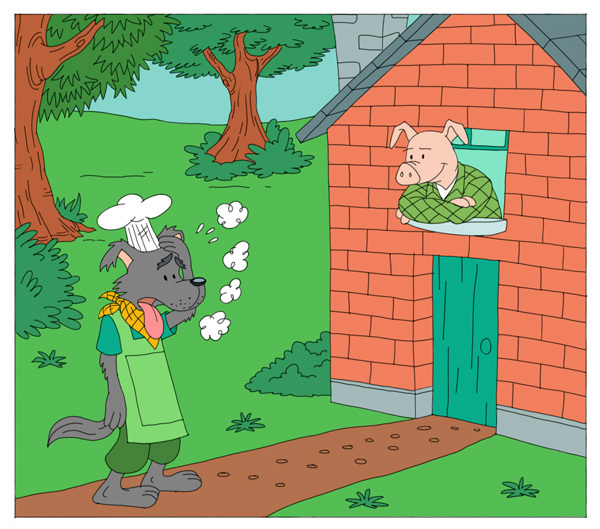 But the three little pigs had spotted him through the window. They made a blazing fire in the hearth, put on a pot of water, which soon began to boil. Just as the wolf was coming down the chimney, they took off the cover, and in fell the wolf. The wolf howled with pain, jumped out of the pot, and ran out the door. “Enough!” he cried. “You win! You win!” He ran down the road and into the woods. He was never heard from again, and the three little pigs lived happy ever after.